Devoted to the Investigation of Spiritual Science. New York, NY. Publisher: Partridge and Brittan. Editor: Joel Tiffany, editor and proprietor, assisted by Rev. William Fishbough. 1/1, March 1, 1856-5/4, August 1859. $3.00 a year (1859 Spiritualists' Register: $2.00). 96 pp. 8vo. No advertisements. Tiffany (1811-1893) became acquainted with the spiritual phenomena when he acted as the attorney for Mrs. Leah Fox Fish in a slander suit against Chauncy Burr who had accused her of fraud. He announced his purpose in starting this journal as the publishing of "a Monthly, devoted to the investigation of the Philosophy of Mind in in its being, action and manifestation in every plane of development, including the Philosophy of Spiritual Manifestation." 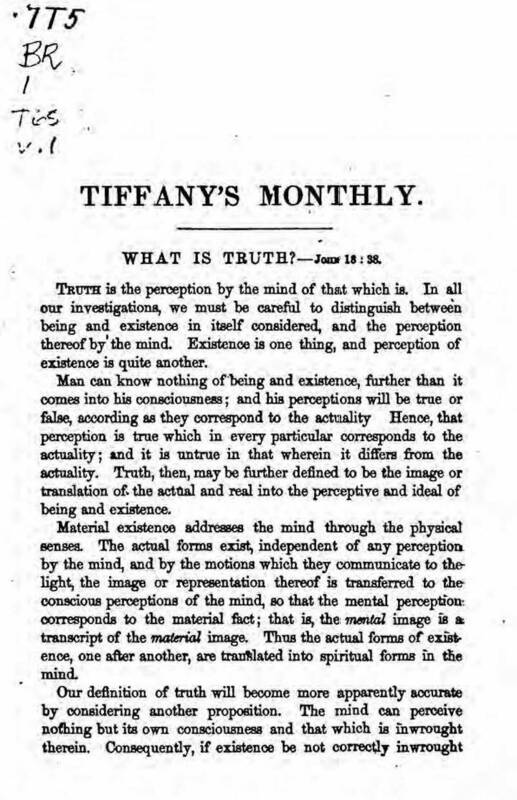 "Tiffany's Monthly," Spiritual Telegraph 5/5 (May 31, 1856). U. Clark's Spiritualist Register for 1858 praises the journal: "This is conceded the most sound, philosophical, and indispensable of the Spiritual periodicals, taking the broadest, loftiest harmonic ground adapted to the needs of all who are seeking the divinest light and life." The articles, most of which were unsigned, were thoughtful, dense and dull. The journal also has a review of Mary Wollstoncraft's Rights of Women, and carries notices of "Od," Emma Hardinge [Britten's] Musical Academy, and Stephen Pearl Andrews' Universology. LOC; NYPL; WHi; Boston Athenaeum.